Heme and blood-feeding parasites: friends or foes? Hemoparasites, like malaria and schistosomes, are constantly faced with the challenges of storing and detoxifying large quantities of heme, released from their catabolism of host erythrocytes. Heme is an essential prosthetic group that forms the reactive core of numerous hemoproteins with diverse biological functions. However, due to its reactive nature, it is also a potentially toxic molecule. Thus, the acquisition and detoxification of heme is likely to be paramount for the survival and establishment of parasitism. Understanding the underlying mechanism involved in this interaction could possibly provide potential novel targets for drug and vaccine development, and disease treatment. However, there remains a wide gap in our understanding of these mechanisms. This review summarizes the biological importance of heme for hemoparasite, and the adaptations utilized in its sequestration and detoxification. Blood is a comprehensive nutrient-rich mixture, consistent in composition and continuously renewable for the life of the host [1, 2]. Hematophagy is in one respect, an easy "way-out" for parasites in acquiring essential nutrients for their development and reproduction . In addition to the abundant examples of blood dwelling protozoan parasites, hematophagous species are found frequently in many parasitic invertebrates, most notably the polyopistocotylean monogeneans, many digenean flukes, nematodes, hirudinean annelids, insects, acarines and crustaceans. There are even notable examples within vertebrate groups that include birds, mammals, reptiles and fish. As red blood cells (RBC) constitute the largest cellular component of blood , their efficient lysis and catabolism are central requirements for blood-feeding parasites . Each parasite is equipped with a repertoire of complex cascades of hemolytic and proteolytic enzymes [3–7], characterized by general functional redundancies in substrate specificity [3, 5, 7, 8]. Heme, an essential prosthetic group, is liberated from Hb by hemoglobinolysis . Exogenous (dietary) heme has been implicated as a source of metabolic heme and iron (Fe) in some hematophagous parasites [10–12]. However, for many parasites, the pathways associated with heme uptake and liberation of Fe are poorly understood, if indeed, they occur. While an essential nutrient, heme in its free form is also potentially toxic and its rapid detoxification in sanguinivorous parasites is paramount for their survival. In this review, the biological importance of heme for hemoparasites, and the adaptations utilized in its sequestration and detoxification are presented. Many authors have highlighted the importance of heme-parasite interaction in survival, development and fecundity of these hematophagus parasites [10, 13–17]. As such, understanding the underlying mechanisms involved in this interaction could possibly provide novel targets for drug and vaccine development, and disease treatment. Heme consists of an iron (Fe) atom bound to four nitrogen atoms of the pyrrole ring of protoporphyrin IX. Fe is a transitional metal, existing in either a ferrous (Fe2+) or a ferric (Fe3+) forms. This transitional property imparts the catalytic nature to many compounds that contain Fe . Porphyrin is an organic compound capable of producing singlet oxygen (1O2) in its excited state . Due to its hydrophobic nature, porphyrin can interact with lipophilic molecules, including proteins and lipids . The reactive nature of both Fe and porphyrin make heme an essential, yet potentially toxic, molecule [18, 19]. Heme forms the reactive core of numerous hemoproteins with diverse biological functions. Heme also interacts with biologically important molecules, either by direct binding, or by transient interaction which lead to free radical generation [19, 20]. In binding macromolecules, heme can destabilize cell membranes, resulting in cell lysis [20–22], or it can bind various transcriptional factors and enzymes, thereby modulating protein synthesis transcriptionally and translationally, leading to the regulation of cell development, differentiation, signal transduction and apoptosis [23–25]. Heme can generate both hydroxyl radicals and reactive oxygen species (ROS) and can induce lipid peroxidation [26–28]. The contained Fe is postulated to catalyze the formation of ROS through the Fenton reaction [19, 22], although the specific heme-H2O2 reaction has also been shown to generate free radicals . Heme-induced free radicals are potentially toxic, capable of damaging and degrading proteins, lipids and DNA molecules [29, 30]. However, low levels of ROS are essential for many biological functions, including the up-regulation of heme biosynthesis, activation of enzymes (e.g catalase) and signal transduction in cells [24, 25]. In non-photosynthetic eukaryotes, heme biosynthesis begins with the condensation of succinyl-CoA and glycine, forming δ-aminolevulinic acid (ALA) and subsequent heme biosynthetic pathway involves seven enzymes (Figure 1) [9, 31]. Heme Biosynthetic Pathway. Initiation of heme biosynthesis begins in the mitochondria with the condensation of succinyl coenzyme A (CoA) and glycine, catalyzed by ALA synthetase (ALA-S), form δ-aminolevulinic acid (ALA). Conserved biosynthetic protoporphyrin IX (PPIX) pathway: ALA is catalyzed by ALA dehydratase (ALA-D) in the cytoplasm to form porphobilinogen (PBG). Four molecules of PBG are combined by PBG deaminase (PBG-D) to form into the cyclic tetrapyrrole hydroxymethylbilane (HMB) and converted to Uroporphyrinogen III (Uro'gen III) by Uroporphyrinogen III synthase (URO-S). Uro'gen III is converted by Uro'gen III decarboxylase (URO-D) to coproorphyrinogen III (Copro'gen III), with the removal of CO2. 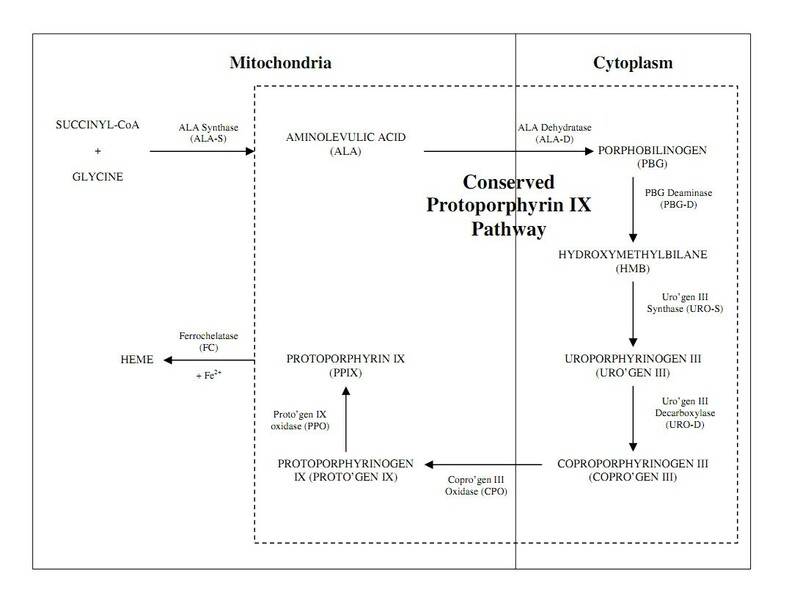 Subsequent conversion of Copro'gen III to Protoporphyrinogen IX (Proto'gen IX) and finally protoporphyrin IX (PPIX) occurs in the mitochondria. This is catalyzed by the actions of Coproporphyrinogen III Oxidase (CPO) and Protophyrinogen IX Oxidase (PPO) respectively. Finally, ferrous iron (Fe2+) is inserted into the cyclic macrocycle through the action of ferrochelatase (FC) in the mitochondria. The evolutionary loss of an endogenous heme biosynthetic pathway is thought to be the concomitant outcome of the adoption of hematophagy in these hemoparasites [32–34]. Complete loss of de novo heme biosynthesis has been postulated for the nematodes Ancylostoma caninum, Haemonchus contortus, Ascaris suum, the nematomorph Paragordius varius (a parasite in the hemocoele of insects), the digeneans Schistosoma mansoni and Philophthalmus megalurus, the tick Rhipicephalus microplus and the hemoflagellate Leishmania tarentolae, losses determined on the basis of the absence of enzymatic activities for ALA-D, PBG-D and FC (See Figure 1) [33, 35, 36]. Partial loss of the heme biosynthetic ability is postulated for the trypanosomatids L. amazonenesis, L. infantum, and Trypanosoma cruzi and the filariid nematode Brugia malayi, in which the first five enzymes of the pathway are thought to be absent, while the latter three are functional [37, 38]. Although some studies suggest that malaria, the filariid Setaria digitata and the triatomid hemipteran, Rhodnius prolixus, synthesize heme de novo[35, 39, 40], other studies of malaria and R. prolixus indicate that these parasites rely, to a certain extent, on host heme [11, 40, 41]. For Plasmodium falciparum and P. berghei, it has been demonstrated that host biosynthetic enzymes present in the RBCs are trafficked into the parasite and account for about 80% of the enzymatic activities of intra-parasite heme biosynthesis . Inhibiting the trafficking of host ALAD leads to death of intrerythrocytic stages of malaria . Evidence for heme uptake pathways has also been found for Trypanosoma cruzi, Leishmania spp and even for non-hematophagous parasites, like the luminal parasitic cestode Hymenolepis microstoma[13, 15, 44, 45]. For these parasites, heme is an absolute nutritional requirement for growth and development, with strong positive correlations between heme availability and parasite growth, survival and reproduction and parasite death in the absence of heme and presence of iron. Uptake of the heme moiety of Hb or heme analogues has also been demonstrated in vivo in Schistosoma mansoni schistosomula, malaria, the tick Rhipicephalus microplus and the triatomine bug Rhodnius prolixus[35, 40, 46, 47]. Loss of an endogenous heme biosynthetic pathway in parasites is theorized to have arisen from two contributing factors. Firstly, hematophagy provides an abundance of readily available heme. Secondly, as stated, de novo heme biosynthesis is an oxygen-dependent pathway, involving eight enzymes (Figure 1). Many endoparasites are facultative anaerobes and anaerobic metabolism is thought to occur as a counter-measure against oxidative stress from Hb catabolism . Therefore, de novo heme biosynthesis might conceivably place undesirable stress on these parasites. Furthermore, loss of an endogenous heme biosynthetic pathway is likely to involve a complex interplay of many factors, including adoption of heteroxenous life cycles, the presence of multiple stages in the life-cycle and the involvement of symbiotic organisms, such as the obligatory endocommensal microbe Wolbachia, which synthesises heme utilized by its hosts [33, 38, 49]. In all multicellular organisms, an efficient set of pathways to circulate heme is essential to ensure that the 'heme pool' is maintained at physiological level . In these organisms, heme is transported from the extracellular-to-intracellular environment and from cytoplasm to mitochondria, and is "scavenging" by molecules when found in its free state. Efficient transmembrane transport of heme is crucial in supporting biological reactions and hemoprotein synthesis [50, 51]. Although Light and Olson (1990) demonstrated that free heme can diffuse across membranes, they showed that passive diffusion is too slow to efficiently support essential biological reactions as well as hemoprotein synthesis. Furthermore, heme binding by cells is a saturable, temperature-dependent, tissue-specific and reversible process . Heme uptake is regulated by factors like hypoxia . Given the potential toxicity of heme, transmembrane movement of heme is likely to be an energy-dependent activity mediated by HTPs. Four HTPs have been identified for mammals, namely, the heme carrier protein (HCP1) , ATP-binding cassette subgroup B member 6 , feline carrier leukemia receptor C and the ATP-binding cassette subgroup G member 2 . Information on the exact mechanisms involved in the transmembrane movement of heme is limited, although it has been suggested to involve specific binding of heme or heme-bound complexes to the membrane surface, followed by active transmembrane transportation possibly through a proton pump . In hematophagus parasites, information on these mechanisms is even scarcer, despite numerous studies showing the utilization and recycling of exogenous heme source (e.g. catabolism of host RBC) as essential for growth and development as well as more specifically embryogenesis. In Leishmania. m. amazonenesis and T. cruzi, heme uptake is saturable and specific. For T. cruzi, heme uptake may involve the presence of an ATP-binding cassette (ABC) transporter , a postulate supported by an inhibition assay of heme uptake, in which accumulation of the fluorescent heme analogue palladium mesoporphyrin was detected at the surface of cells after pre-incubation of parasites with cyclosporin A, an inhibitor of ABC transporters including P-glycoproteins (PgP) . Since studies of Leishmania have demonstrated the lack of a functional heme biosynthetic enzymatic pathway [13, 15, 44, 45], exogenous heme transported through HTPs could also be a source of heme for these parasites. Due to its reactive nature, heme is usually bound to protein in circulation, and is rarely found as a free molecule. HBPs are important components for heme detoxification and for recycling of heme and Fe, since they allow the targeting of heme to specific tissues such as the liver [58, 59], while protecting other tissues against heme-mediated damage [58, 60]. In humans, this sequestration and recycling of circulating heme and Hb during intravascular hemolysis and tissue damage, has been attributed to three main heme binding proteins: haptoglobin , hemopexin and albumin . For blood-feeding parasites, catabolism of host RBC results in the release of large quantities of heme. This concentration of dietary heme represents a condition unlike that observed for mammals, in which heme abundance is tightly regulated. Parasitic arthropods, including the ticks, mosquitoes and hemipterans [61–63] express HBPs. Two HBPs of ixodid and argasid ticks are hemelipoglyco-carrier protein (CP) and vitellogenin (Vg) [61, 64]. CP and VG are similar in structure, binding affinity to heme, lipid and carbohydrates, and in signaling cascades leading to their expression during blood-feeding, but have distinct functions, tissue distribution, and regulatory controls . CP (also known as HeLp in Rhipicephalus microplus)  is a major hemolymph protein composed of two subunits, with molecular mass ranging from 200 to 500kDa . CP is detected in both male and female parasites, is highly expressed in the fat bodies and salivary glands and is up-regulated in response to blood-feeding . CP is thought to sequester heme and subsequently transfer it to the hemocoel [61, 66], for subsequent transfer to other cytoplasmic HBPs to meet the heme needs of these parasites . Vg, a precursor of the large multimeric yolk protein, is found primarily in the female tick and egg, although it is synthesized by fat bodies [4, 64, 66]. Vg is induced by mating and increased levels of ecdysteroid, is secreted into the hemolymph and then transported and incorporated into developing oocytes by receptor mediated endocytosis [61, 66]. A 15kDa heme-binding protein (RHBP), which shares similar functions with Vg of ticks, has been isolated from both the hemolymph and oocytes of Rhodnius prolixus. As with Vg, RHBP is postulated to deliver heme to developing oocytes for vitellogenesis and embryogenesis [61, 68]. While knowledge of HBPs in arthropods is accumulating, the data on HBPs of helminth parasites is scant. Annotated screening of genomic datasets of S. mansoni reveal a putative heme-binding protein, which shares a conserved tertiary fold structure with members of the SOUL/HBP superfamily . Transcription of this schistosome molecule is increased 3-4-fold in schistosomules cultured in the presence of RBC compared with those cultured in media alone . The elevated transcription of a molecule bearing structural similarity with known heme transporters in the presence of Hb suggests that this helminth also expresses functional HBPs. The requirement to excrete and detoxify the bulk of ingested heme is essential for hematophagous organisms. This can be demonstrated in the in vitro culture of L. donovani, in which elevated heme concentrations results in parasite death . Moreover, the success of anti-parasitic compounds, such as the quinolines and artemether, both of which are postulated to inhibit heme detoxification pathways in malaria and schistosomes [72–74], is strong evidence for the importance of this pathway. Numerous detoxification mechanisms have been identified in parasitic organisms (Figure 2), including the breaking down of heme into Fe and less reactive intermediates, the containment of heme by a physical barrier, and converting heme into an inert crystalline structure. 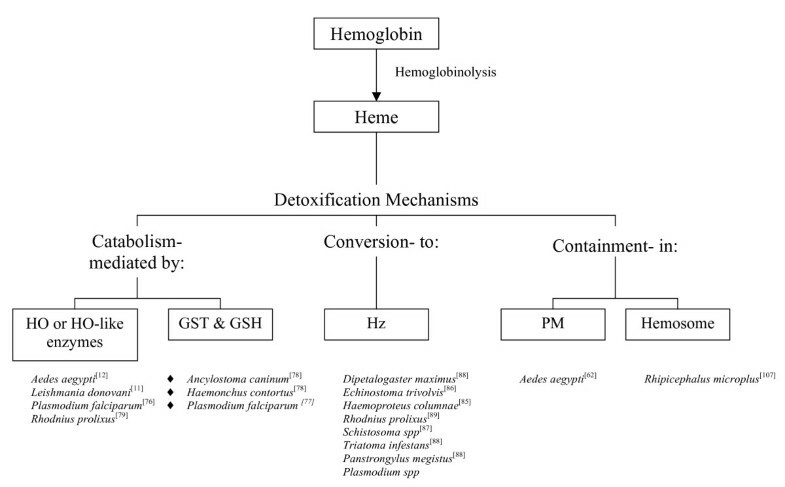 Summary of the known and possible heme detoxification mechanisms in hematophagous parasites, based on data published in references [11, 12, 62, 76–79, 86–89, 107]. Abbreviations: HO, heme oxygenase; GST, glutathione-S-transferase; GSH, reduced glutathione; Hz, hemozoin; PM, peritrophic matrix. In the presence of oxygen and NADPH, human heme oxygenase (HO) catalyzes the oxidation of heme to α-meso-hydroxyheme, verdoheme and finally, biliverdin. Biliverdin is further metabolized to bilirubin and excreted in the bile, conjugated with glucuronic acid . Similar catalytic mechanisms by HO-like proteins are postulated to also occur in bacteria and plants . Conclusive evidence for HO-like activity in haematophagous parasites is lacking, although there has been recent reports indicating that HO-like activity does occur [11, 77]. The absence of HO homologues in parasitic organisms have led some researchers to postulate alternative pathways for heme catabolism and Fe rescue [78, 79]. Injection of excess heme into the hemocoel of R. prolixus results in the production of a biliverdin-like compound (RpBV), which differs from biliverdin in possessing two additional cysteine residues , an observation that strongly suggests HO-like activity in this hemipteran . Similarly, HO-like catabolic system is thought to exist in Aedes aeypti, as it has been shown that most Fe in adult mosquitoes are derived from host heme . Recently, a P. falciparum HO (PfHO), which shares similar heme catabolic activity with mammalian HO despite limited amino acid sequence identity, has been identified . PfHO is similar to plastidial HO of cyanobacteria, algae and other higher plants, all of which use reduced ferredoxin as its electron source, instead of NADPH cytochrome P450 reductase as the mammalian HO does . HO-like activity has also been demonstrated for P. berghei and it has been noted that significantly higher HO activities were detected in chloroquine-resistant strains . Members of the glutathione-S-transferase (GST) family characteristically catalyze the breakdown of endogenous and exogenous toxins with a demonstrated heme catabolic activity found in reduced glutathione (GSH) . Multiple heme-responsive GSTs with high affinity binding to heme have been identified in H. contortus and A caninum using sub-proteomic approaches and it has been suggested that GST is important for transport and detoxification of heme [78, 79]. Fueled by reports indicating a correlation between chloroquine (CLQ) resistance in malaria with a loss of hemozoin formation , it has been proposed that other heme detoxification mechanisms are present in resistant parasites. GST and GSH are thought to be important components in the alternative detoxification of heme in malaria [78, 79, 83], since increased GST and GSH activities [81, 83, 84] occurs in CLQ-resistant strains. It is possible that malaria GST acts by binding heme and conjugating it to GSH . GSH, through a series of reactions in the presence of oxygen, produces free radicals that cleave heme at the porphyrin ring, releasing Fe . There remain questions as to how this mechanism supports heme detoxification in these parasites, including how they deal with the free radicals and how Fe is generated. Furthermore, human GST (hGST) is only active at pH > 6.5  whereas the optimum pH of P. falciparum GST (PfGST) is 8.8 . However, the digestive vacuoles of the malaria parasite are acidic , indicating GST and GSH activity may not occur in that compartment, which is the site of heme release. Hz formation is a heme detoxification mechanism observed only in hematophagus parasites. It is interesting that Hz formation is found in divergent groups of parasites including malaria, schistosomes (Figure 3) and some insects. Transmission Electron Microscope image of the gastrodermis (syncytial absorptive gut lining) of an adult female Schistosoma japonicum. The parasite was fixed in 3% glutaraldehyde in cacodylate buffer supplemented with 5% tannic acid, followed by fixation in osmium tetroxide and embedded in Spurr's resin. Hemozoin formation in the schistosome gut occurs in structure believed to be epicellular vacuolar compartments (or luminal pockets of the gastrodermis-see Delcroix et al. ) formed by extensive growth of surface lamellae of the syncytial lining. A. Micrograph of apical region of the gastrodermal syncytium showing abundant epicellular vacuolar compartments (arrows). The pale bodies (H) in the lumens of the vacuoles are regions of hemoglobin. The dark bodies (Hz) are hemozoin crystals. B. Enlargement of boxed region of A. Hemozoin forms at the surface of lipid particles. Abbreviations: H-fragment of erythrocyte; Hz-hemozoin; L-lamella of gastrodermis. Subsequent to the initial association of the pigment with malaria, this detoxification mechanism has also been described for the protistan Haemoproteus columnae, the digeneans Echinostoma trivolvis and Schistosoma[87, 88] and triatomine bugs [89, 90]. The Hz polymerization pathway is proposed to be an excellent therapeutic target for malaria and other parasites [72–74]. The antimalarial quinoline, for example, limits intra-erythrocytic parasite growth by inhibiting Hz formation . Similarly, quinoline inhibits Hz formation in S. mansoni in vivo and in vitro[73, 91]. Hz is single unit polymer of heme [92, 93]. Based on its physical and molecular properties, Hz differs from heme aggregates, but is similar to the synthetic β-hematin . Unlike heme aggregates, Hz is insoluble in bicarbonate buffer and SDS  and shows the two characteristic peaks at 1,209 and 1,662 cm-1 with absence of the characteristic heme peak at 1,707 cm-1 by FTIR spectra . The structure of Hz has been confirmed by X-ray diffraction , infrared spectroscopy and extended absorption fine structure (EXAFS) [94, 98] as a lattice of hydrogen-bonded heme dimers, linked in a head-to-tail manner via iron-carboxylate bond with the ferric iron of one heme unit bound to the propionate side chain of another heme unit. The mechanisms of Hz formation among different parasites remain unresolved. Proteins, lipids, alcohol, acids and even an autocatalytic mechanism have been proposed to bring about the efficient conversion of heme to Hz. Most recently, neutral lipids have been implicated as the primary catalysts  causing heme to be converted to β-hematin at the lipid surface by interaction with lipid polar heads. Growth of the β-hematin crystal appears limited by the curvature of the lipid particle . Protein was once thought to facilitate the polymerization of Hz , although this hypothesis has more recently been discounted . It is now thought that proteins function as initiation sites for the primary nucleation step or as chaperones for delivery of heme to the lipid nanosphere through high affinity binding to heme . Two proteins, a histidine-rich protein (HRP) and heme detoxification protein (HDP) have been identified in Plasmodium spp as potential initiation sites for Hz formation. These histidine-rich proteins bind with high affinity to heme, indicating possible bis-histidyl heme iron coordination [103, 4] . However, the involvement of HRP as an essential catalytic component of Hz formation has been questioned, because Hz conversion has been noted in some malaria species in the absence of a functional HRP . On the other hand, malaria HDP is able to mediate high levels of heme conversion, is highly conserved across the Plasmodium genus, and is internalized into food vacuoles of the parasite, suggesting a role in Hz formation . An efficient means used by some blood-feeding parasites to separate heme is by the use of a physical barrier, as seen ion PMs. These structures line the mid-gut of invertebrates and are synthesized by one or more stages of the majority of insects examined . PMs are semi-permeable structures that encase an ingested meal, partitioning it from the gut epithelial cell lining while retaining selective permeability to derived compounds and nutrients . PMs are complex matrices, composed of proteins, proteoglycans and chitins , and are thought to protect the intestinal epithelium against damage caused by the abrasion of food particles . In hematophagous arthropods, PMs may also protect against damage from toxic metabolites , as well as against invasion by viruses and bacteria . Heme binds specifically to the PM of Ae. aegypti, suggesting a possible role for the matrix in heme containment. Such binding is thought to be augmented by Ae. aegypti intestinal mucin (AeIMUCI), which has been isolated from both the larvae and adults . Expression of AeIMUCI is induced by metal feeding and the protein can bind to chitin as well as large amounts of heme in vitro. Taken together, these data suggest that the role of the PM in heme detoxification may be more than just that of a passive physical barrier. An intriguing heme detoxification pathway has been identified for the tick Rhipicephalus microplus, in which heme is accumulated as a non-crystalline aggregate in a specialized organelle of midgut epithelium, the hemosome . FTIR spectroscopy of hemosomes revealed that the heme aggregate is distinct from hemozoin and is structurally bonded by a novel heme-based interaction with non-heme components in the hemosome . 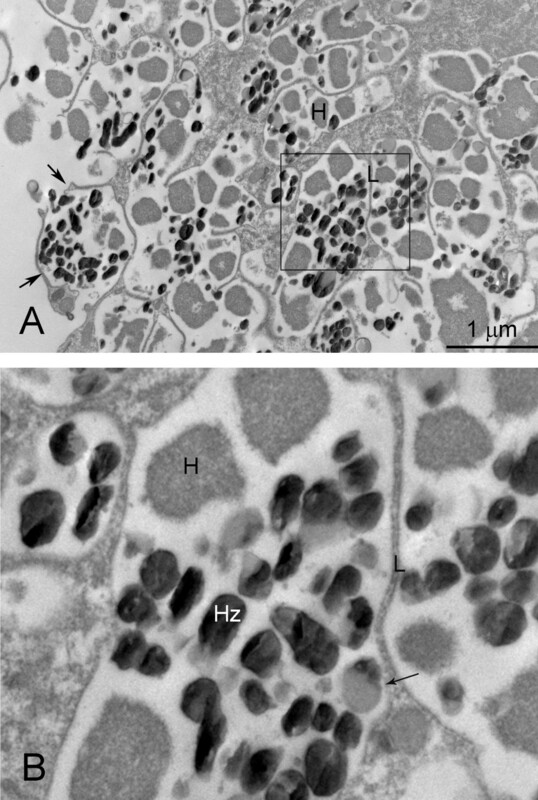 A mature hemosome consists of a compact centre, composed of approximately 90% heme aggregates, surrounded by a multi-layered cortex, surrounded in turn by a lipid bilayer . Heme is transported from the digestive vacuoles of mid-gut epithelial cells into hemosomes . The exact mechanism facilitating this is unknown, but may involve the use of heme transporters or binding proteins . At completion of digestion of the blood meal and maturation of the hemosomes, the digestive cells detach from the gut wall and are subsequently excreted from the tick with feces . What is the source of heme for many of these parasites? Is there an alternative heme biosynthetic pathway present in these parasites? What are the underlying mechanisms involved in the targeting and uptake of heme in these parasites? What is the importance of heme as an iron source and what enzymatic reactions are involved in catalyzing the release of iron? Are strategies for heme acquisition and distribution completely distinct, or are there overlapping activities . What other novel heme detoxification methods are utilized by these parasites? Do helminths express novel HBPs for cytoplasmic storage and intercellular transport of heme? Despite agreement that pathways of heme biosynthesis, uptake, detoxification and even breakdown might provide potential important targets for drugs and vaccine development, there remain wide gaps in our understanding of the molecular regulation of these events. In helminths the available information regarding parasite-heme interactions remains limited. This is perhaps due to the absence of easily amenable life cycles and inherent difficulties in culturing the different life cycle stages in these parasites. There is thus great need for further work on adaptations of helminths for heme and iron metabolism . We thank Ms Alyson Auliff of the Army Malaria Unit, Brisbane Australia and Ms Erica Lovas of the University of Queensland, who prepared the samples for Figure 3. MKJ acknowledges funding from the National Health and Medical Research Foundation of Australia. SQT: Wrote drafts, contributed to design of review AG, GNG, MKJ: Critical review of manuscript; contribution to conception and design. All authors approve of this version of the manuscript and agree to its publication.